Facts about Call Ducks. The Call Duck is a breed of domesticated duck which has been raised primarily for ornamental purposes and as a pet. The Call duck species appears to be similar to Mallard duck although it has a smaller body size compared to the Mallard duck. The American Bantam Association also known as the "Bantam Standard" has the Drake Call Duck weighing 1.3 to 1.5 pounds (.6 to .7 kg) and the Hen weigh 1 to 1.3 lb (.5 to .6 kg). Scientific name for Call Duck "Anas Platyrhynchos" meaning - Wild dabbling duck from which domestic ducks are descended; widely distributed. From New Latin "anas" meaning (Duck) and the word Platyrhynchos comes from "platyrrhine", Ancient Greek meaning (broad snouted, flat-bridged nose). Call Ducks are birds in the Class of "Aves". Ducks of all types are part of the bird family "Anatidae". Call Ducks are also called "waterfowls" they are generally found in places were there is water, such as ponds, rivers, streams, lakes and occasionally your back yard pool. The definition of Anatidaephobia is irrational fear that you are being watched by a duck. The Call Duck was previously used as a decoy resulting to its common name the Decoy Duck or the Coy. The Call Duck originally comes from the Netherlands (Holland) and the name comes from the Dutch word kooi- meaning (trap or cage). These decoy ducks have been used in Holland and Britain for centuries with a high pitched unique call to coax wild ducks into mesh structures and funnel traps "decoys". As time went on hunters would use Call Ducks to coax other species of ducks within gun range. Nowadays there are many other ways hunters attract ducks, duck calling whistles fake decoy ducks in the ponds extra. In some writings including the Van Gink, writing in The Feathered World in the year 1932 suggests that other bantam breed species have been imported to Netherlands in the 17th century and there is a possibility that the importation of the duck species were made by the Dutch captains who came from Japan, particularly since the Call Duck varieties are very different from the common European species of ducks to disport from it. In addition, the Call Duck breed is true considering that it is a very old-established breed species. However, it wasn't until 1850s that the Call Duck breed species was introduced to the British Isles and by the year 1865, it was one of the first six waterfowl breeds to be graded in the region although the Call Duck breed became rare by the middle of the 20th century. Call Ducks are related to swans and geese and the duck is the smallest of these birds with shorter wings and neck and a stocky body. Call Ducks on average, live 4 to 8 years and can live up to 12 years, depending on the breed. Call Ducks are omnivores; meaning - an animal that eats food of both animal and plant and origin. A Call Duck is a Precocial (meaning) Born or hatched with the eyes open, a covering of hair or down, capable of a high degree of independent activity from birth and able to leave the nest just a few hours after hatching. Through determined efforts by a few of the British breeders restored the population of the Call Duck breed making them to be very common today. 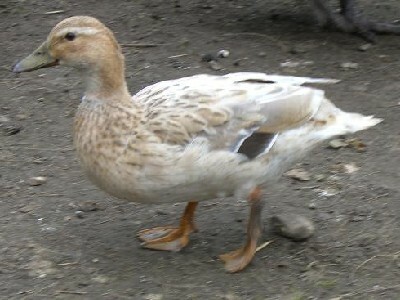 In some regions of the United States, the White and Gray Call Duck varieties had been listed in the first Standard of Perfection. The use of the Call Duck breed species in duck hunting was permanently banned in many of the states since the activities led to over-harvesting of the Call Duck varieties by the hunters. This was because the activities were not in line with the conservation efforts that were then being realized. The Call Duck is a very popular exhibition bird. In addition, the duck has won many duck championships in shows than any other duck breed in regions of North America. Call Ducks have webbed feet, that makes them act like paddles, designed for swimming. They push their webbed paddle feet back in a kicking motion, this allows them to move swift through the water and when the feet come back, they will close for less water resistance. The Call Ducks paddle feet do not feel cold, even when it swims in cold icy water. The webbed feet makes a Call Duck waddle instead of walk. The male Call Duck will guard their nest by chasing away other ducks. Once the female Call Duck lays 5 to 8 eggs, she will start to sit on her eggs to keep them warm so that they can hatch into baby ducklings. The eggs will hatch on average within 26 to 28 days. Baby Call ducklings are able to fly within 5 to 8 weeks. A male adult "Call Duck" is called a (drake) and a adult female "Call Duck" is called a (hen). A young baby duck is called a (duckling). A group of ducks is called a brace, raft, team, flock, or paddling. The male ducks (drakes) are the brighter colored ducks while the female (hen) are usually a plain colored for hiding purposes to be camouflaged from their enemies when they are sitting in their nests. A "bill" is what is call a Call Ducks mouth. There are no teeth in the Call Ducks bill, they have rows of thin bristles, which helps them to filter pieces of nutrition out of the water. Call Ducks swallow there food whole and it goes to an organ called a gizzard, were the food is first ground up and than moves on to the stomach. The different bill shapes and sizes for finding food, has over time mutated to fit each environment. The Call Ducks bill is flat and broad and has rows of fine incision along the outer edge called "lamellae". meaning a thin membrane, plate, scale or layer, as of cell wall or bone tissue. The larnellae helps the Call Duck to clutch food for feeding. A special feature that the Call Duck has is its water-proof feathers, even when the duck dives underwater, its downy under-layer of feathers will stay totally 100% dry. There is a special gland called the "Preen Gland" also called Oil Gland or Uropygial, that produces oil that is near the Call Ducks tail which covers and spreads the outer coat of the Call Ducks feathers, which makes the duck water-proof. Underneath the water-proof coat are downy soft fluffy feathers which keep the Call Ducks body warm. Call Ducks keep clean by being able to turn their heads completely backwards, and put their beaks into their feathers by preening themselves. The Call Ducks feet have capillaries which help blood flow to their feet. The warm blood flow down the leg and creates a heat exchange system. When the blood flows down the leg, it meets the cold blood and is warmed up to keep the ducks feet warm. Call Ducks feet are thin because they contain soft tissue and few muscles. Call Ducks see in color with very good vision and can see well underwater.